ALWAYS ENJOY COMPLIMENTARY LABELS. FREE SHIPPING ON ORDERS OF $50 OR MORE. FREE RUSH SHIPPING ON ORDERS OF $75 OR MORE. Back in 2001 when Bachcroft Labels first began, wedding labels for envelope addressing were virtually unheard-of, and using them was all but unthinkable, says Jean Vileta, the company's founder. "For most people, the question was, with girlfriends and relatives available to help with addressing wedding envelopes, who would do such a thing? And why would any woman want to put labels on her wedding invitation envelopes knowing that her guests would immediately know that she had not painstakingly hand address their envelopes?" But, says Vileta, "often, people don't do something not because it's not a perfectly good idea but because they don't know how to do it, or because they simply don't know that it can be done." As a former public relations director and someone who knows and understands good manners and proper etiquette, Vileta had the self-confidence to take her business idea to the next level. By 2007, a rapidly growing number of young women (and considerably older women, for that matter) could quickly answer those questions based upon their own decision to use wedding labels or the decision of couples they knew who had used wedding labels. "From the start, I just knew that people would be interested in Bachcroft's wedding mailing label collections, and not just our wedding return address labels," she says. "Brides-to-be were spending a lot of money on lovely wedding invitations and they wanted the addressing for their guests to look perfect, too," says Vileta. "These were busy young women--many of them were professional women--who weren't squeamish about using modern technology to get the addressing they wanted. When it came to the wedding labels themselves, their only questions were "Are your wedding labels well-made?" and "How soon should we order the wedding address labels?"." Now, wedding labels are not simply trendy. They're in and they're here to stay, and for good reasons, says Vileta. For one thing, times have changed and so have the lives of today's brides-to-be. By the time today's typical female is ready to seriously consider marriage, chances are she is gainfully employed, independent, and socially active. Frequently, that means there are not many available hours left in her day for detail work. And even when there are, she is not likely to be interested in spending whatever available time she has doing the same kinds of things the world traditionally expected her to do and took for granted she would do. 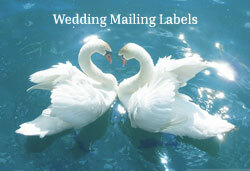 Wedding labels are perfect for today's brides-to-be and brides. Like her male counterpart and soon-to-be husband or her new husband, she avoids as many unnecessary, clerical-type tasks as she possibly can. Those that she chooses to do are dispatched with aplomb and her own personal style. "I think one of the things that makes Bachcroft's wedding labels a popular choice is that we offer her so many options to choose from, so her personal style is certainly reflected in the choices she makes," says Vileta. Another reason for the growing popularity of wedding labels is transparency, she says. "Few wedding guests would assume, or could be persuaded to believe, that the couple sat down and personally hand addressed 200 or 300 invitation envelopes. Given that reality, does it make any sense to pretend that they did? Probably not, is the common reasoning. And, of course, they're right." What today's wedding guests really want is courtesy and consideration and to feel confidant that they weren't invited as an after thought, she says. "And they want the wedding couple to enjoy their special day and enjoy sharing it with them. They're not going to feel better about knowing that she wrote like the dickens and lost countless hours of sleep just to make sure that each and every wedding invitation envelope was hand addressed by her. That would be silly," says Vileta. "After all, this isn't the nineteenth century, and many couples plan really large weddings these days. People don't usually have their wedding invitations hand delivered anymore, and very few women hand write their invitations anymore." "If one wishes to have a calligrapher or one's mother and Aunt Millie hand address the invitation envelopes, that's wonderful, assuming they are available," she says. "If they are not, the couple can probably have their stationer include the envelope addressing with the invitation printing, for an additional fee. Either way, the bride and groom should not assume that their guests will be deceived. They will not be, and today's sophisticated couples know that." Then there is the sheer cost of wedding invitations and coordinating envelopes today. Good quality invitations and envelopes are pricey. "Frequently," Vileta says, "the choice becomes, either we ask for mom and Aunt Millie's help and settle for "less than perfect" addressing on our expensive wedding invitation envelopes, pay a calligrapher $2.00 per envelope to hand address them, have our wedding stationer address the envelopes for slightly less than what a calligrapher will charge per envelope, or shop for stationery-quality wedding labels." Given the available options, a rapidly growing number of couples these days are choosing to look for a stationer who sells and prints stationery-quality wedding labels. Since stationers who print wedding labels can usually match the typestyle used on the invitations and will professionally typeset each of the names and addresses individually, all the couple has to do is supply their wedding mailing list for printing. call customer service at 1-800-960-3234 or at 1-888-333-0234 to speak with a representative. Enjoy free shipping whenever you place an order of $50 or more. All orders of $75 or more automatically ship to you with free rush delivery. Start your invitation planning with Bachcroft's fine stationery self-adhesive address labels. Then, have us do all of your guest list addressing, free of charge. While you're placing your order, tell us which free designer or monogram return address labels you'd like us to include—compliments of Bachcroft. © 2018 BACHCROFT & CO.